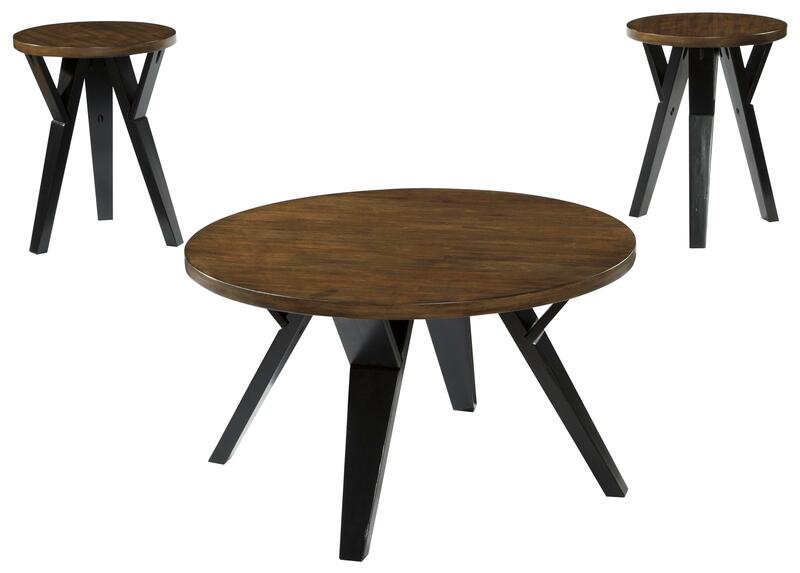 Contemporary with a retro design influence, this occasional table set has versatile style for any living room. The round table tops on the cocktail table and two end tables have a medium brown finish to showcase the natural beauty of wood veneers, while the dark brown finish tapered legs with unique braces provide contrasting style. Cocktail Table: 36"W x 36"D x 20"H.
End Tables: 18"W x 18"D x 24"H.
The Ingel Retro-Contemporary 3-Piece Occasional Table Set by Signature Design by Ashley at Value City Furniture in the New Jersey, NJ, Staten Island, Hoboken area. Product availability may vary. Contact us for the most current availability on this product.